So you’ve set up a LinkedIn Profile, filled in all your details. Are you still having trouble getting the connections you need? LinkedIn research shows that the most important part of your profile is actually having a LinkedIn headshot. Just by having a business portrait makes your profile 14 times more likely to be viewed! Will any old photo get your profile viewed? There are hundreds of thousands of professionals in Sydney with corporate headshots. As Sydney corporate photographers we’ve seen and noticed lots of variations, and not all of them good. LinkedIn’s 2nd tip says that your face should also be clearly visible and take up most of the frame. This sounds quite simple, but in a simple search we found that up to 20% of profile photos did not meet this criteria! On the screen your profile photo is less than 2cm high. Can your photograph make an impression in such a small space? Here are some example photos that are perfectly fine for some purposes, but would not serve well as a professional headshot or branding image. We found some people used ‘in action’ or event shots for their profile. It’s often distracting because of other things going on in the photo. You also cannot show your personality or professional qualities from these photos. 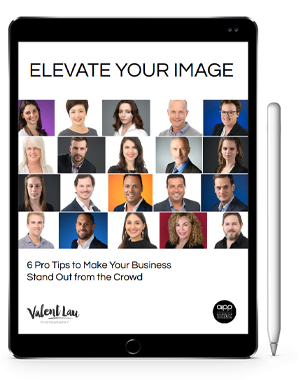 It’s an opportunity lost, and it also sends your clients the message that you don’t take this seriously enough to get a proper headshot. This is also surprisingly common. Pretty travel or scenery photos where 1. your face is too small to be seen, or 2. you’re not facing the camera. Sometimes there’s more than one person in the photo. We’ve also seen someone standing under a big tree, and someone doing a handstand on a surfboard. These types of photos tell me nothing about the person in a professional capacity. Some people used photos that look pretty cool, but where they are looking away somewhere. For example someone playing on a keyboard, someone working on a computer. This may be good as a larger photo on an about page, but as a profile photo there is no connection with the viewer. Another opportunity lost. In a few industries, especially in wedding and event industries, we saw people using group photos as their profile photo. Apart from being so small we couldn’t see the faces anyway, how would anyone know which one you are? You may as well not have a photo. Is your LinkedIn profile photo working for you? Do you stand apart (in a good way) from your competitors in Sydney? If not, contact us right away. When we create your corporate headshot, we work with you to show your best qualities in the photograph. Your headshot is there to make the right impression to your clients. Whether you need to look confident, intelligent, personable or serious, compassionate or agressive, we work with you so that the right qualities are evident in your photograph. How much would it be worth to you, to be able to convey all the right messages in a split second? For your profile photo to jump out in a sea of photos? Valent Lau Photography provides Personal Branding Photography in the studio in Eastern Suburbs or at your business location. Contact us now and let us help you make your best first impression.